Taking into account the blustery wind conditions, Santa opted for a more high-tech means of travel in Loudoun today. 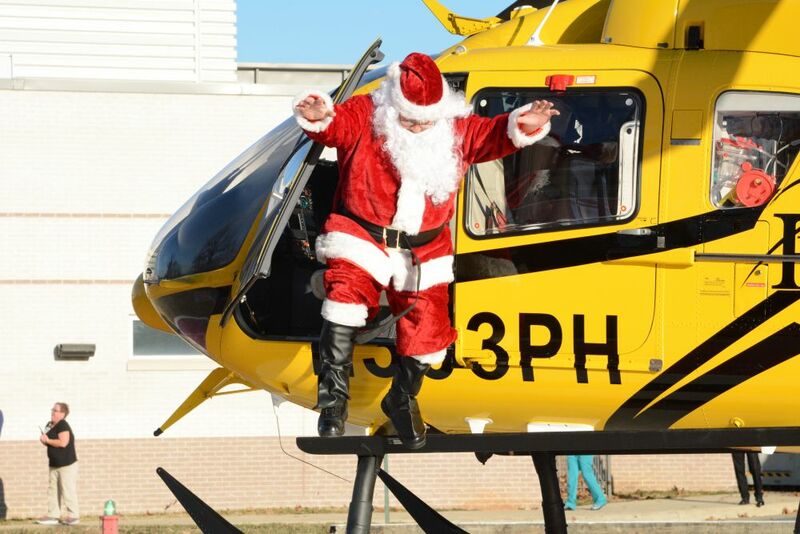 He flew via helicopter to Inova Loudoun Hospital to visit with the county’s youngest patients. A second after they heard the sound of the chopper, patients as young as 18 months old pressed their faces against the windows of the Pediatric Unit to try to catch a glimpse of the man in red. “Where’s Mrs. Santa?” one boy asked Santa. Santa tries to make it to Inova Loudoun Hospital each December to visit children who will likely not get to be home for Christmas, let alone be able stop by the mall to sit on his lap and rattle off their gift wish list. This is the first year he arrived at the hospital by helicopter. Three-year-old Miles Bergman’s chin hung open as the big guy made his way toward him. He was too stunned to speak. “He has been very excited about this,” his grandmother, Toni Keys of Sterling, offered. The visit brought a smile to Will Walters’ face. The 2-year-old has had a tough few days, undergoing surgery to have his tonsils and adenoids removed. They had gotten so swollen, it was hard for him to breath. “He doesn’t like the IV in his arm—it’s hard for him to understand why it’s there,” said his mother, AnnieLaurie Walters, of Leesburg. His visit from Santa, plus a music therapist who played instruments with him, made the hospital stay better than Walters could have imagined. “If you’re going to be in the hospital at Christmas time, this is the best case scenario,” she said. 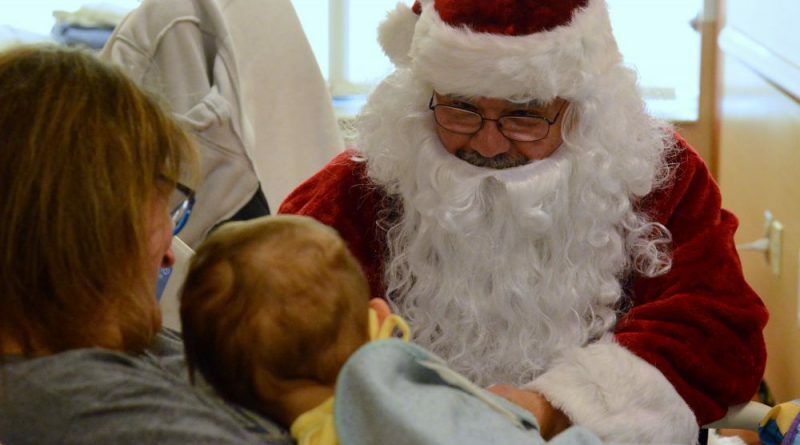 Santa is also planning visits to Inova Loudoun Hospital’s Medical Campus in Leesburg and the Ashburn HealthPlex. He will arrive via a fire engine, courtesy of Loudoun County Fire-Rescue.